Dice of the First Degree: Vassal, you say? So you kinda want to try playing Warmachine online huh? Curious what all it is, takes and how hard it is to set up? Let's tackle it, and maybe I can help you out. Vassals got some good points, and definitely some bad ones. The no brainer is that for one, it's online. It's the only way to play that buddy in Canada or Norway that you met on the forums. So that's cool. For two, it's a fantastic way to play new, unreleased models, like pSturgis or Cygnar's new Journeywoman sweetheart, Allison Jakes. Just pull a model out with the same base and relabel it. Thirdly, it's a great way to play that 14 Charger eNemo list without spending a hundred dollars on a bunch of charger kits to find out that you don't like playing that list. Those are all great points, and I actually think I recommend Vassal as a proxy/trial run for a player running a budget. There's definitely some models I wouldn't own now if I'd run them a few times on Vassal first. This is one reason I don't currently own Gallant. On the flip side, it's online, and the experience is much different. The look and feel is gone, the models and painting is no longer required, and your painted Arcane Tempest Gun Mages will manage looks of contempt as you reach into the bag for their playing card, but not them. For two, it'll screw with your ability to gauge distance. It's really hard to guess distances in Vassal at first, and that transition from Vassal to Tabletop always has a few casualties. It's also very very slow. Not because of Vassal, but simply because of the format. Take 30 models, pick them up and move them with your hand. Now move them to the same spots with arrow keys. It's not nearly as precise, and you spend time backing them around, trying to get them where you want them and turning them to face the way you need them to. Then type to your opponent what you're doing with those bane knights. That takes time. Measuring kills you. Measuring in Vassal requires unveiled threats against programmers and sacrifices of newborn kittens. AOEs are clumsy and take a bit to get used to, and then connections drop and yeah. It takes awhile. 15pts is going to take a minimum of a half hour, forty five minutes, if not an hour and a half. I've very rarely finished a 35pt game in less than three hours. The dice will have you crying. So far, I've rolled 3 pairs of 2s for damage with the Stormclad not once, not twice, but three times. If you're betting on averages in Vassal, you're better off assuming that you're going to get a 1 every other roll. Overall, I hate vassal in comparison to the tabletop. I'd much rather bust out the models and tape measure, and work my models across the board. So much better. Sometimes though, my schedule doesn't allow it, or distance across this planet makes a game with a buddy an impossibility. So Vassal, it is. I do like being able to play models I don't own, and I like being able to do it from the comfort of my couch, but then when I roll those double twos three times in a row, I want to pitch the computer across the room. It's a brutal love/hate relationship. Now that we've gotten the ramble out of the way, let's get into it. Is your computer fast enough? Quite probably. I don't know many computers that can't handle Vassal, so don't worry about that. Your internet might be a different story over long cross-country connections, but for the most part, you should be just fine. You're certainly not going to suffer from lag like you would in Modern Warfare 3. Two seconds of glitching is not the prime time for your opponent to knife you in Warmachine Vassal. So where do you start? You'll need the Vassal program. Vassal runs a lot of different games, including Warhammer, Axis and Allies, all kinds of stuff. Just takes some loyal fan to write up a module for it. We want the Warmachine module. Currently, it's at v4.3. And located here. 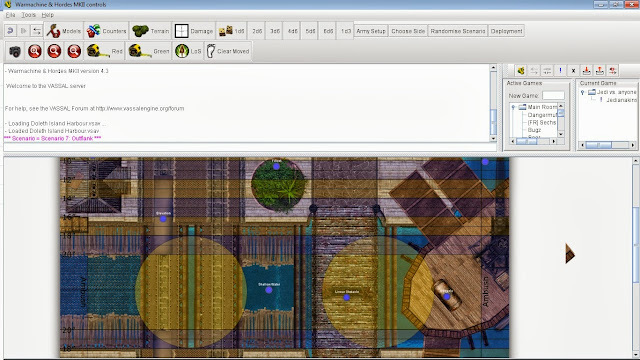 Download Vassal, download the module and open it with the program and bam, you've got it. Open the program and double click your module and it'll ask you if you want to play a game offline, look for a game online, and something else. Playing a game offline is really boring because... it's just you. This isn't some freebie with a selectable-difficulty AI to wage war against you. So look for a game online. This'll take you to a chatroom looking place with a lot of buttons. We'll talk about those in a second. On the right, there's two diffent bars full of names. One is "Active Games". These are rooms you can join, assuming they're unlocked, to either view a game or you can type a game name into "New Game" (Circled below on the far right) and create a new room. The "Current Game" window is the room you're currently in. You can right click on names in the windows and private message them, seeing if they're up for a game. The button on the right above "New Game" with an exclamation point on it basically says you're looking for a game, so there's that as well. Models: This is where you'll find your factions models. There's a dropdown box to select between Hordes and Warmachine, tabs to select factions, then another dropdown to selects types of models. E.g., Warcasters, Warjacks, Units, so on, so forth. The box on the right will list the models available, the middle box will list the versions of that model (Stryker will have both eStryker and pStryker) and a battle damage grid. The last box will show the model itself. If you select the battle damage grid, it's literally a gird. Kraye's has 18 boxes because... his card has 18 boxes. Tracking? Click the boxes to grey them out and mark damage. Next is Counters. Counters will bring up a window very similar to the above, but with AOEs, deviation templates, sprays, and tokens for buffs/debuffs and other spells. Fairly straightforward. Terrain. Terrain doesn't get used unless you make your own map. The existing maps have excellent terrain, so no worries there. Damage. Damage is where you can choose to keep all of your damage grids. Makes things pretend to be organized that way. 1d6 - 1d3 are dice rolling buttons. 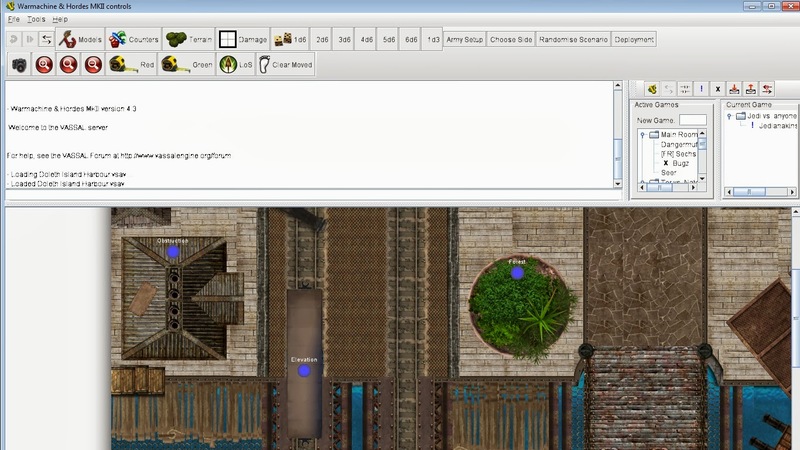 Clicking them sends chat messages with randomized numbers 1-6. You'll learn to hate these buttons. Army Setup. Once you've loaded a game, you can click this button to bring up a small window to drag the models you want from the Models window you see above, into the Army Setup window. 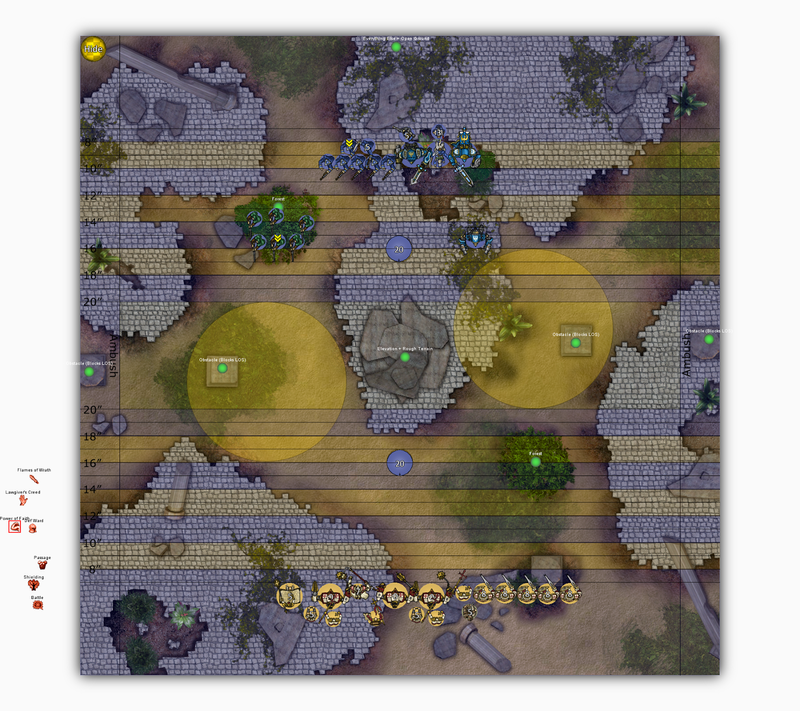 When you're ready to deploy, you'll select the whole army and set them on the map. Randomize Scenario. Kinda like the dice buttons, but randomly selects a scenario. Vassal thinks everybody brings light artillery, incidentally. Deployement. 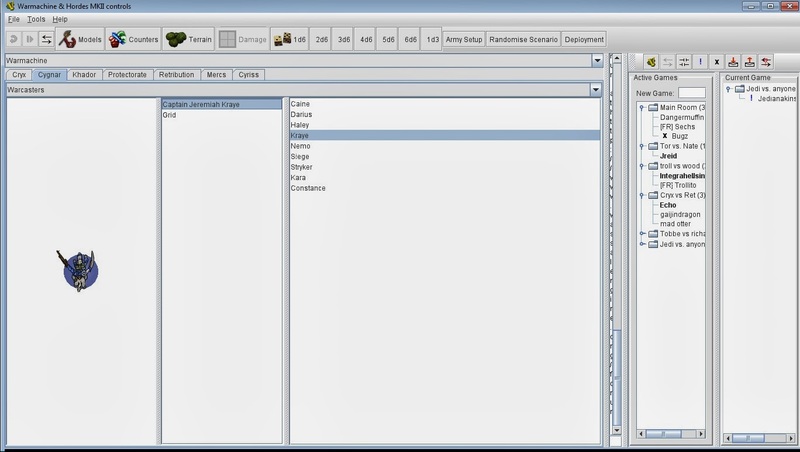 Deployement will bring up a window much like the Models window that will give you the Steam Roller 2013 scenarios, and the deployement screen. If you've already rolled for scenario, select the scenario from this window, drag it out onto the map, and double-click, and then drag out the deploy button as well and do the same thing. Now let's put this all together. Click file. Go to New Game, and pick a category of maps. New Maps has the best variety. Anymore, I just go there. Today I've selected Doleth Island Harbor. It will ask you which player you are loading as and either one works, and sometimes it only gives you one option. Whatever. Live under the assumption that Vassal is an acid addict. Makes things simpler. Pretty map, huh? 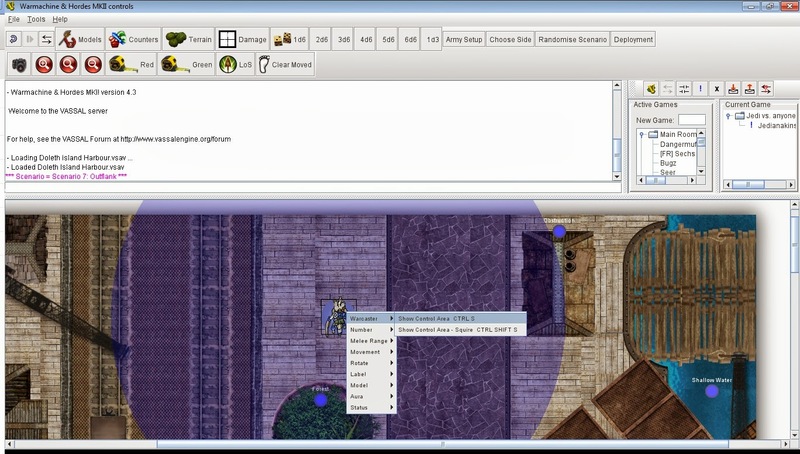 That's another nice thing about Vassal. They've got pretty slick maps with excellent terrain. Much better than what you'll probably ever play on unless you know Poppabear from the forums. This also opens up a lot of new buttons, including zoom tools. That's besides the point. I'm rolling for scenario. It gives me Scenario 7, which is outflank. I'll open up my Deployment window. Cool huh? Off to the left, my opponent has placed his spells and debuffs and all kinds of crazy nonsense that Menoth is capable of. Those tokens all came out of the Counters window, and he relabeled them. When you're done, up in the left corner of the map is two buttons, one right on top of the other. If you dragged the Scenerio out first, it's on the bottom, and Deploy is on the top. Select it, right click, delete. If you did it backwards, you'll need to reapply the Scenario. Now play! Let's go over that part of the process real quick, huh? Try and save you some frustration. Select your unit and play with it for a second if this is your first time, or just you messing around in Vassal by yourself. Make sure your opponent, if you have one, is aware that you're clueless here, and just trying to get used to Vassal. Push your Up key. This moves the selected model/unit 1'' in the direction it's currently facing. Down key is back 1''. Pushing either the Right or Left arrow will rotate ten degrees that direction. Fairly simple, so far. This lets you move things much simpler rather than trying to measure everything. You'll still find it hard to go the perfect direction on the charge though, so you'll still need to measure like normal for some activations, but mostly, the up and down keys are your money shots here. Right click your caster. This gives you a menu. At the top it has "Warcaster". By hovering here, it gives you another menu. Show Control, and Show Control with Squire. (Cygnar only options, suckers). Click one, and it displays a circle of your control area. Mess with this menu for awhile, ok? If you're going to play a lot of Vassal, start memorizing key shortcuts. "N" on your keyboard will drop a number on the unit selected. Number is the next menu we see above, but the keyboard is much easier. Pressing "B" or "M" will raise or lower that number, respectively. This is nice to show focus on a warcaster, or hitpoints on multi-wound models like UAs or Tempest Blazers. Melee Range drops a half-circle shape out to show what you can actually reach, and Reach is the same thing, but 2''. Rotate is self-explanatory, and typically better accomplished with the keyboard arrow keys as well. Label just lets you change the name. Nice for Proxy, or for putting you DEF/ARM stats on the name so your opponent can see them by hovering over the model. Model lets you cycle the art. This is great for two reasons. One is that it gets rid of the art, and gives you the actual Base of the model, which is nice for Base-to-base measurements and whatnot. The second thing is that it has a wreck marker for Jacks. Cycling the art is accomplished by the "[" and "]" keys, if you don't want to use the menu. The other button in there is Delete, for when your model is killed. Aura establishes a glow around the models selected. "Y", "G", "R" and "T" for Yellow, Green, Red and Teal, respectively. This is great for a lot of things. I use Yellow and Teal to show what units have Tough and Arcane Shield, while Red functions to tell me what models have gone. It's also nice to select the enemy's model and give him an aura so you can show him which model you're attacking. Half the fight in Vassal is trying to get past the fact that you don't have fingers to point with and he can't hear you say "Jr. gives the Centurion Arcane Shield." Status has a bunch of markers in it for Knocked Down, Corrosion, Fire, so on, so forth. Pretty slick, and they're attached to the model so that it can move and all that and you're not dragging the other markers with it. Keep in mind that the right-click menu exists for all units, not just your warcaster. It's fine-tuned per unit. Madlyn Corbeau has a 9'' CMD range, the Minuteman has a 2'' flak field range, and the Rangers have a 5'' Mark target range. The guys who do this stuff are pretty specific and do a good job of it. Last, but not least, there's three new buttons that, as a player, you need to know about. These are the Red, Green and LOS tapes in the menu above the map. Red and Green are both simple tape measures. They'll tell you distance like they're confused on the metric system. E.G., 79 is 7.9 inches. These two buttons are insanely frustrating. Click the button, either red or green, doesn't matter. Now click and drag out on the map. Now release, and click again. Your tape measure button should get it's respective Aura to show that it's solid, and the line is in place. Now you can move your models normally. The LOS is the same tool, but doesn't show distance. This is nice for determining if you CAN charge a model based on LOS, without pre-measuring and possibly avoiding a failed charge. Now, when you click to solidify your tape line, if you click a model, or too many times, or anything crazy, your tape measure will go ballistic. Sometimes, you can't do anything with it, and, it'll just sit there measuring 23.4'' across the map and into the white border for no good reason. Click the button, try dragging the tape. Rinse and repeat. May take a few times, and it may be that your opponent is using the tape too. You should be set for your first game. The other point I want to make before we transition though, is etiquette. I'm not any kind of an expert on the thing, and I get frustrated with Vassal quite easily. Sometimes it's the opponent, sometimes the program. But be patient on Vassal. People get rules wrong, and there's a lot of rules in this game. Be nice, be professional. Don't drag around your opponent's models or delete them off the board unless he wants you to. Treat this as you would a regular table top game. I've had multiple opponents start hitting the back button (Upper left, curved arrow) because they want to ask a question. Just ask the question, and if we need to go back, we can. Nothing frustrates me more than someone taking over my models. Have some common sense. Tell your opponent what you're doing. He's not there to hear you. Type it out. Yes, this takes forever, but you can't simply start moving stuff and expect him to know. Realize that if you forget to say something like "Runewood gives eStryker pathfinder", eStryker doesn't have pathfinder. Think about those kinds of things, and treat Vassal as you would the tabletop. We got that? The last thing is that I recommend you get War Room and start expanding your collection of cards. That and develop a relationship with battlecollege. You don't have the benefit of reading your opponent's cards before the game, but out of respect for him, let him play his army. It's not right for you to limit what he can or can't play because you're not familiar with those units. This is Warmachine. There's a lot of units. It's a game of pass/fail learning on the job. You have a vast amount of online resources at your grasp while you're playing, make use of them if you want to know what you're up against. You may actually be better prepared than if you'd had his cards. You should be good to go. Have fun, and I hope you know what's going on, thanks to this tutorial. Now, if you're wanting to do a Batrep of the thing, there's two more pieces of advice. For one, go to File and select Begin Logfile. This will allow you to record the game and go through the whole thing to see what all was said, and what all happened. The other is the Camera button. It saves overall map images of the whole battle and very nicely too. The trick is what to save it as. If you just simply save the file, it doesn't give it an image extension and you'll need to open it in paint and resave it. Unless, you save it as a .png. This saved me a lot of hassle, and most image hosting websites will host .png without issue. And there you go. Welcome to Vassal. I hope this helps you get going and makes the first few games of floundering about a bit more enjoyeable for you. Any comments, questions, suggestions, leave 'em below and pass on some advice, fellow Vassal players. Great guide. I've used Vassal for 40K but not for Warmachine. I'd have been lost without it. No problems. It's great for getting those extra games in, and generally, guys on Vassal know the rules better than I do, so it's good for that too.